Executive Minibus Hire for London and the South-East. 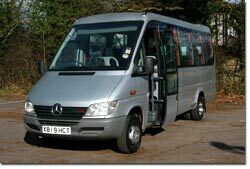 Adelphi Travel is a reputable minibus hire company, born out of an association with a large independent tour operator. We have a long history within the coaching and events industries and offer executive minibus hire services including London airport transfers, corporate travel, coach tours and contract hire. Our luxury minibuses offer the very best in group travel, each boasting high quality interiors with Vogel coach seats with seatbelts, panoramic windows with tinted glass and air conditioning. Our Mercedes Sorocco minibuses are also capable of carrying large amounts of luggage in a separate boot area. Our drivers are considered to be our ambassadors and you can be assured that our clients will always receive a VIP service. Adelphi Travel also welcomes corporate accounts for minibus shuttle services and contract hire. For information about our services please view the relevant sections on our website or if you know what you need please call 01293 820311 or use our quotation form found on the contact page.